For better or worse, Abu Issa’s rise to unchallenged leader of a burgeoning mini-state is a motif being repeated across the country. As the authority of Assad’s regime recedes, power is passing not into one unified opposition, but into the hands of many local rebel leaders. In Jebel Zawiya alone, a region of only about 300,000 inhabitants, there are two major rebel groups, a third emerging, and a smattering of smaller ones tucked under other umbrellas. Several national opposition groups, often more brands than organizations, may have become well known on the international stage, but they have trifling clout on the ground. In some ways, of course, this is entirely fitting. After being ruled for over forty years by one strongman, every Syrian, from the southern plains of Deraa to the eastern expanses of Deir Ezzor, has his own idea of what the country should look like; each man determined to have a task that he can call his own. But as each stakes out his own claim to his own plot of land and, with it, his own plot of power, it becomes harder to imagine Syrians being able to (or in some cases, wanting to) re-invest that power in a central authority. THE RUGGED PEAKS AND gentle troughs of Jebel Zawiya are a hidden paradise, where some thirty villages and hamlets nestled among orchards of fleshy fruit have long allowed men and women to live off the land. Neon-green minarets soar into blue skies, while cool breezes carry off the chatter of the women and children from the balconies of simple cement homes. Nowhere more than in this hilly, isolated outpost does Idleb’s reputation as the “The Forgotten Province” apply. History has left its footprint across Syria with the scattering of Roman outposts and Crusader castles, but with few markers here, folklore and oral history alone define the region’s identity. 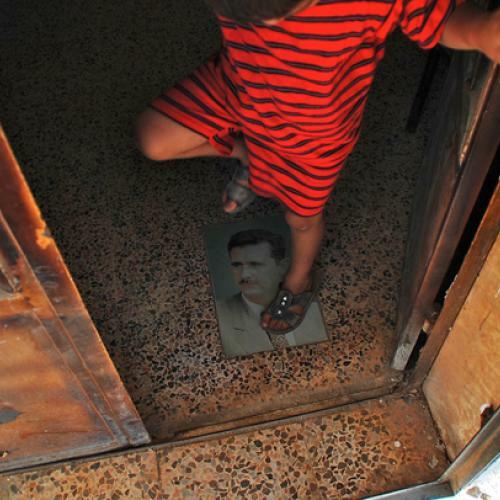 No topic is now more central to that history than the crimes of the regime. Bad blood with the Assads in this uniformly Sunni area started from day one of Hafez al-Assad’s rise to power; residents say they chucked tomatoes at the president during a visit early in his rule. The fresh produce was not well received, and from then on, neither were the region’s people. Hard feelings intensified in the decades that followed as the regime cracked down on a revolt led by the Muslim Brotherhood in the 1970s and 1980s. The movement had found support among Idleb’s devout population, but locals say its presence in Jebel Zawiya was always tenuous, like that of any outsider who tried to gain a foothold in the mountains. Yet men in Serjeh tell stories of fathers snatched off their farms and disappeared into prisons, their long beards deemed crime enough. Government institutions subsequently built little presence; few of the burgeoning youth ventured out to university. Like every place’s collective identity, some of the area’s is as imagined as real, and is rapidly being redrawn as events of the past year unfold. In truth, many residents welcomed employment in the Assad regime’s security forces, and Baathist land reforms and access to credit that allowed each man to own his own grove (to this day, Idleb has the highest percentage of rural population of any of Syria’s 14 provinces). But a decade of economic reforms had voided that social contract, and Idleb’s people became some of the first to stage protests in March 2011, which continue to this day. And when the regime responded with violent attacks, Idleb’s men were among the first to pick up guns. “Everyone had them anyway, and what else could we do?” one woman asks us, with a shrug. In Jebel Zawiya, as much as elsewhere in Syria, it is now local battalions, not activists nor the foreign-based opposition institutions, driving the country’s political dynamics. A joint attack by Abu Issa’s Saqour al-Sham and two other groups is credited with ending the (very shaky) U.N.-brokered ceasefire when on May 28 they attacked and took over two army checkpoints in the villages of Mughara and Marayan. 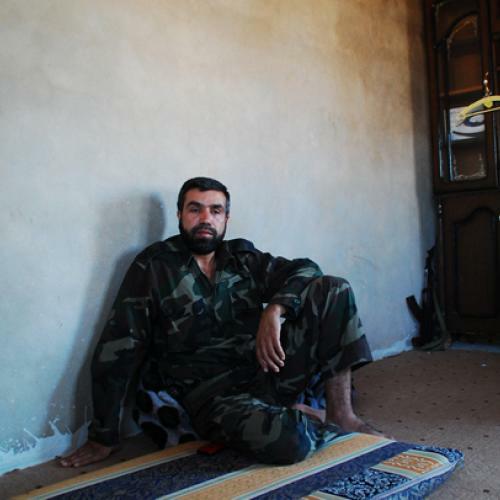 By June 1st, Riyad al-Asaad, the nominal head of the Free Syrian Army—to which all of the groups in Jebel Zawiya emphasized they did not belong—was forced to admit that the rebels had renounced the truce. When we visited at the beginning of August, the rebels had only just finished what they started that balmy night in May. As July came to a close they launched another offensive, destroying 18 of the 30-odd army checkpoints that had come to pockmark the landscape. Today there are only a few lonely army outposts inside Jebel Zawiya, though hundreds of tanks remain parked at its edges. During our visit the booms of gunfire and explosions reverberated through the hills as soldiers at one checkpoint in al-Rami sent shells flying into surrounding villages. But on the ground, the rebels reigned. Idleb can now no longer be pushed to one side. Jebel Zawiya’s villages sit at the intersection of arteries on which the regime relies: the north-south highway connecting the capital Damascus to Aleppo, the second city, and the east-west road to the Mediterranean coast at Latakia, the Assad family’s ancestral home. This has made it impossible for the army to move on the ground without losing men and weapons, since the rebels have lined both highways with improvised explosives. They now have ambitious plans to push the regime’s forces out of the rest of Idleb province so weapons smuggled in from Turkey can be distributed and rebel commanders can meet openly. This was the same area where Assad’s adversaries, mainly Western states and Turkey, had considered establishing a safe zone. They have been deterred by Syrians’ divisions over foreign intervention and Western fears over embroilment in another regional quagmire as the civil war burgeons into a proxy battle between Assad’s foreign backers and foes. But it may soon be the de facto situation as other local powers—including warlords like Abu Issa and their Persian Gulf financial backers—have begun to build safe zones of their own. The result is a Syrian opposition that is continuing to fracture as militarization deepens. After focusing on attempts to unify foreign-based councils, Western powers and their partners only recently turned to strengthening civilian institutions inside and providing non-lethal support to assist in the creation of a new democratic regime. But the political status quo in Syria has shifted. 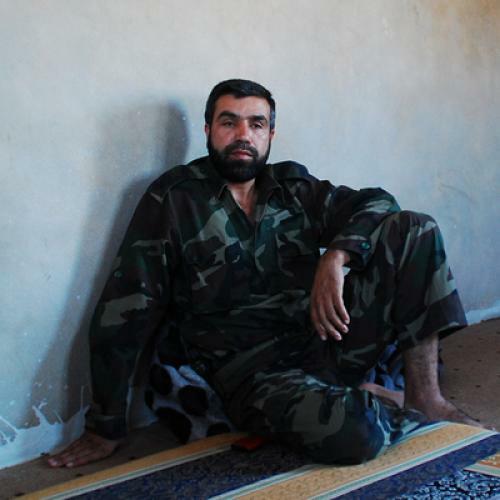 The real power brokers in Syria are the rebel leaders on the ground. JAMAL MAAROUF’S TURF STARTS where Abu Issa’s stops, but for a few villages where the two groups happily coexist. We tracked down the second of Jebel Zawiya’s two main rebel warlords in his home in Deir Sunbil, a cluster of squat houses out in the sticks where children in ragged clothes scamper around without shoes. His loitering fighters have a simple country charm that should not be mistaken for a lack of professionalism. 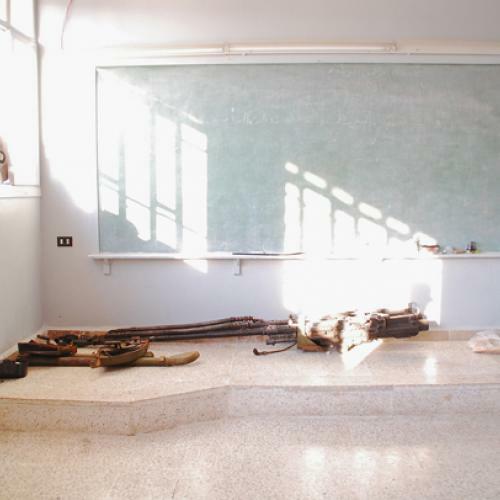 An assistant proffers a typed up list detailing every member of the Martyrs of Jebel Zawiya Brigade, now known as the Martyrs of Syria, and the serial numbers of the weapons they hold. As with Abu Issa, Jamal’s rule relies on a rough form of meritocracy, attributed by fighters younger than his forty-something years. His men recount with awe how Jamal organized massive protests, then grabbed a gun and took on the army when it first tried to enter Jebel Zawiya. Residents, especially women, whose role has diminished with the militarization, have little say in who controls their area, but are broadly supportive—if only because these are the choices of their husbands, brothers and sons. Tanned, well-built and with thoughtful deep brown eyes, Jamal exudes the calm confidence of a man who has nothing to prove. He wears army fatigues with leather flip flops and speaks softly but firmly. Seated on the floor cushions in an unadorned room but for fabric flowers that ornament the dresser, his men sit around watchfully, listening intently and obeying immediately when he issues a command. A hint to his values is given by the battalion names, lifted from nationalist rather than religious figures. He wants a democratic state, he says, in which institutions are not trampled over as they have been under the Assads. He explains that he works in coordination with a new gathering of rebel leaders, the Idleb Military Council, “because I don’t want chaos.” Without his own outside backers he has to be more of a team player to ensure funding from the council, some of which he gives to the families of his men to help cover costs. Late one afternoon, he drives us to what used to be a school where, alongside stockpiles of weapons grabbed from attacks against checkpoints, he is holding thirteen men as prisoners. We ask to see them one by one, alone, and, unlike Abu Issa, he agrees. Some have been taken to be exchanged for money or fighters held by the regime. Another, who recently abandoned his security post in Damascus, says he is being held until Maarouf’s men confirm his defection story; he expects to be released the following day. One prisoner, angry at being taken, calls the rebels terrorists. Staff rebut this: a former police officer called Wael claims to investigate the men before deciding their fate. No prisoner bears the marks of torture. With their institutions firmly established, Abu Issa and Jamal Maarouf control the expanse of Jebel Zawiya and beyond, but their authority has not deterred other rebel leaders from carving out a patch to call their own. Some are a handful of boys with a Facebook page and one street to their name; others professional get-ups of fighters and defectors who dominate in a particular village. Affiliations are loose; ideologies are fluid. Name sharing is often a symbolic show of unity rather than a marker of a formal relationship. Religiously-motivated and Salafist groups are growing in number, but some take on the cast to attract funding (they still shake hands with women as they explain how Salafist they are); others follow a secular ideology. The men boast that having many groups creates no problem because in “Free Syria” everyone works as “one hand.” Rebel commanders talk. Joint attacks, whether coordinated or a process of rebels scrambling to help others, have made Jebel Zawiya’s units stronger than the sum of their parts. But differences inevitably reveal themselves. The Bakrans illustrate another source of the multiplying rebel chieftains: activists turning rebels. When the revolution started in March 2011 the family became active in the civil movement that organized protests, liaised with the exiled political opposition, and set up food and garbage collection services, in a parallel coexistence with the growing armed resistance. But as the regime’s violence increased and the men with the guns became the ones driving the movement, some protest leaders refashioned themselves as fighters. Drawing in other sons of Marayan and neighbouring Ihsem, Ali planted his brigade among the village’s residents. Ali’s men are clear that their mandate is only until the regime falls. “Then I’ll put down my weapon, vote in elections, and go back to my old life,” Ibrahim, a pensive 30-year-old shoemaker turned Qisas member, says. Suspicions that others may not have the same idea cause distrust and competition to simmer just below the surface. The Bakrans know it is hard to compete with bigger and better-funded groups. We witness a tense moment in their media centre after the brigade loses four men in an attack in Ariha. “We need weapons! We need money!” shouts Ali’s brother Ahmad. “We can’t afford to lose men like this.” They start making frantic Skype calls and pressure visiting journalists to “donate” to the group. Another cause of furrowed brows is the increasingly religious bent adopted by some fighters, in some cases a genuine belief; in others to attract money flowing from devout Gulfi donors. Some locals try to deter us from meeting Abu Issa. “They’re Islamists, funded by the Muslim Brotherhood!” warns one. Our guides come up with all manner of excuses not to go to Serjeh: Abu Issa is traveling, it’s too dangerous there, there are government checkpoints on the only road, it’s too far. They are palpably nervous when we eventually arrive and full of praise when we leave (“Excellent, excellent! A great man!”), as if fearful that Abu Issa will overhear them saying otherwise. JEBEL ZAWIYA’S REBEL LEADERS do not have fighter jets or rockets to match the regime, but they could become more prominent—and better acquainted with the outside world—yet. By upping the cost to the regime of maintaining isolated positions and using the highways, they have started to carve out their own version of a much talked-about free zone. Airstrikes, as came increasingly crashing down on Serjeh and Deir Sunbil in August, are a cause for fear; yet the skies are increasingly threatened by anti-aircraft guns the rebels have captured. Over time, that might just give them the strength to push out the army in the cities of Idleb and Ariha, which would give them control of major roads. More importantly, the men in Jabal Zawiya offer an insight into the evolving power structures in Syria as Bashar al-Assad’s regime contracts. The groups are currently bound together by a common aim to rid the country of Assad and strive not to act like his regime, but the seeds of struggles are being planted—aided by the brewing geopolitical reckoning. Rather than build the united country once imagined by protesters, rebel warlords are each taking their own bit of land and implementing their own vision—though militarily coordination continues. Maarouf is creating a police force and referring to Syrian national laws. 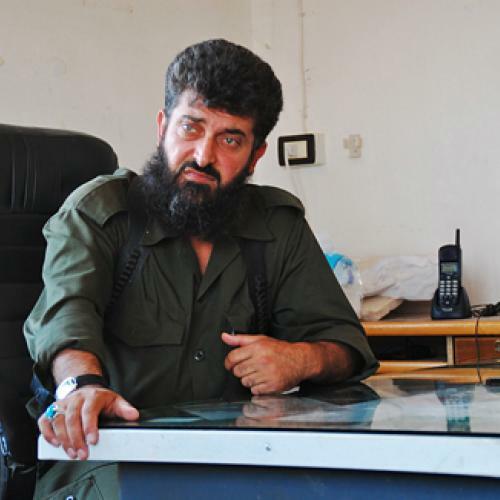 Abu Issa is constructing his fiefdom based on religious principles. Ali Bakran, perhaps the most representative of the protesters’ original aims, is, for now at least, losing out.